The three countries in the world with arguably the greatest emerging infectious disease threats at this time are China, Egypt, and Saudi Arabia - countries that also share a decided lack of press freedom as evidenced by the map above and the following ranking chart. Notably, all three countries have seen significant erosion in press freedom over the past 5 years, with Egypt's being the most precipitous, dropping from #127 on the list to #158. 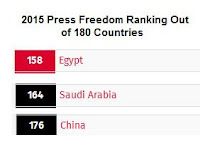 Of the three, Egypt is the least repressive (if you grade on the curve) and also has the most recent experience with a (relatively) freer press, so we occasionally see the Egyptian media try to `push the envelope', often in creative ways. Last week, in Keeping One Eye On Egypt (Again) we looked at media reports (and official denials) of (you pick: anywhere between 10, 16, or 30+) suspected bird flu cases in Port Said. Despite adamant denials by the Port Said Health Ministry on the 23rd (see Health Directorate in Port Said declares negative cases of suspected bird flu), on the 24th CNN (Arabic) went with the following (translated) report claiming 8 positive H5N1 cases. Cairo, Egypt (CNN) - Health authorities announced in Egypt Wednesday, 8 for recording injuries mankind virus H5N1 virus that causes "bird flu", raising fears of a return of the disease which caused a lot of panic in different parts of the world recently. She added that after samples of suspected cases analysis, the results of the analysis showed that 8 cases of them were "positive" for the avian influenza virus, while the results show the 8 others injured as "seasonal influenza." The above report is offered not to claim a cover up, but merely to show the level of confusion in the media, and the kind of back and forth reporting of `facts' we are witnessing. As I wrote last week with the initial report of 31 suspect cases, there are a lot of far more likely causes for these hospitalized cases than avian flu. Adding to the general confusion, the Egyptian MOH website has been offline a good deal of the past week and has yet to post a statement on these cases. Their Bird Flu FAQ is also more than a year out of date, still listing 180 total bird flu cases since 2006 (the latest WHO number is nearly twice that, at 346). Refuting media reports, denials continue to flow out of Egypt, and now include admonitions to ignore media rumors. He denied Dr. Adel Teilb, Undersecretary of the Ministry of Health in Port Said what appeared in the media and news sites and pages of social networking "Facebook" of the existence of positive cases infected with bird flu since revealed the samples contained the results of the central laboratory of the Ministry of Health in Cairo ten cases that have detained fever hospital under observation for negative results for avian influenza and the only positive for seasonal flu, and appealed to citizens to receive news from the correct sources and called on the media not to publish news that excite public opinion without support or guide. Over the past 36 hours Arabic media, and twitter, has been filled with additional reports of suspected bird flu cases and denials (see The death of 8 cases of seasonal flu Dakahlia) - and even a suspected MERS case - although the validity of these reports is suspect. Detained Mansoura Chest Hospital, on Saturday evening, a physician anesthesia, for suspected infection «Corona», and was placed isolation room, and take the necessary wipes, and sent to the laboratories of the Ministry of Health in Cairo, analyzed, to. For his part, Dr. Saad al-Makki, Undersecretary of the Ministry of Health, told «Egyptian today» that the doctor «Mamed.h.k», 35 years old, coming from Saudi Arabia, at dawn on Saturday, and entered Ghamr hospital complaining of severe flu, and stress, and a rise in temperature, and the pain of the body, pointing out that it-like symptoms of infection with «Corona». Dakahlia hospitals detained three citizens including a doctor on suspicion of being infected with "Corona", after returning from performing Umrah in Saudi Arabia. Dr. Saad al-Makki, Undersecretary of the Ministry of Health Dakahlia, Dr book "Mamed.h" in Mansoura Chest Hospital, and two other people dead immersion Central Hospital, after rising temperatures after returning from Saudi Arabia. These symptoms are consistent with seasonal flu, pneumonia, avian flu, MERS, and a variety other respiratory viral infections, making MERS only one of many possibilities. The fact that fatalities have been reported does nothing to negate the possibility these are seasonal flu. Some media outlets are using the controversy over the reporting of these suspect cases, the strident official denials, and the resultant confusion of the public as their story - perhaps giving them a `safer' way to print stories about these outbreaks without incurring official wrath. The announcement of a number of media reports new cases of bird flu entering the winter season, if controversial, among assurances, denied the citizen remains confused after some media announced that the Ministry of health on 16 suspected cases of the virus in the region of port Fouad, specifying that the test results showed that eight of them tested positive, 8 others for seasonal influenza. Dr. Adel teilab, Undersecretary of the Ministry of health, the media reports is not true at all, and that the suspected cases were not infected with bird flu virus, but only cases of seasonal influenza, adding that he has ordered the formation of a medical team to survey an area easy Tina East port, consisting of doctors and veterinarians and prevention viruses; after the emergence of cases of suspected Bird flu in the region and isolate the 10 people to hospital, viruses. Whatever the actual situation with avian flu (or MERS) in Egypt, with nearly every media flu report now carrying an official denial, it is pretty obvious the MOH is in full blown damage control mode. Their failure to maintain their MOH website and to provide daily bird flu updates (like they used to) has led to a huge information vacuum, one into which all manner of rumor, speculation, innuendo and fears now flow. All of which means that while we can still watch Egypt (and China, and Saudi Arabia) looking for signs of bird flu or MERS activity, we do so with a lot less confidence than we had only few short years ago.